Create the instance in the Western US region. Specify a 10 GB boot disk. Explicitly specify option to delete boot disk when the VM instance is deleted. Provide read-write access to Google Cloud Storage. – Get generic memory/availability info about the instance, output it to a file and upload it to the cloud bucket. Google cloud services are very similar to the AWS and if you are familiar with AWS, Google Cloud Platform for AWS Professionals can be a really useful site. While the syntax and semantics of the SDK, APIs, or command-line tools provided by AWS and Google Cloud Platform, the underlying infrastructure and logic is very similar. One of the first things you need to do is download, install and initialize the cloud SDK on your local machine. It contains gcloud, gsutil, and bq, which you can use to access Google Compute Engine, Google Cloud Storage, Google BigQuery, and other products and services from the command-line. You can run these tools interactively or in your automated scripts (as you will see later in this example). The SDK has a set of properties that govern the behavior of the gcloud command-line tool and other SDK tools. You can use these properties to control the behavior of gcloud commands across invocations. You also need to create a gcloud account if you dont have one – and its really helpful if you have a gmail account that you can connect it to. This way when you initialize gcloud on your local machine, you can authorize access to Google Cloud Platform using a service account. The gcloud console is very similar to the AWS dashboard and you can view/control all your instances/resources from the console. The console is an easy to use interface and quite intuitive. Most of what you can do from the console can be done from the command line or using a Rest API. However, one of the things you cannot do from the command line is create a ‘Project‘ – and this is something that is different in gcloud compared to AWS. You must first create a project, get a project id which you have to reference when you spin up instances directly from the command line. Initializing/configuring the SDK is fairly straightforward- just follow the instructions. I set up my default region to be us-west1a and set up my default project as “stanford”. I was given a project id “stanford-147200″ and I needed to reference that every time I wanted to access an instance associated with that project, start a new instance associated with that project etc. Note: you can set up multiple configurations for multiple projects and move between them quite easily because of this partitioning into “projects”. Its like creating multiple virtual environments! If you want to store the output from the jobs run on the instance, you need to set up a cloud bucket. This is analogous to to s3 on AWS. This can be done via the console or the command line using the gsutil. You can create a bucket directly from the instance as well (as part of a script) -which is what I will do. Note: when you launch an instance, you have to specify the project id, and the bucket is created for that project. –maintenance-policy “MIGRATE” :Specifies the behavior of the instances when their host machines undergo maintenance. The default is MIGRATE. –tags “http-server”,”https-server” : allow http and https traffic ie open port 80 and 443. –boot-disk-device-name “stanford2” : The name the guest operating system will see for the boot disk as. # Description: SCGPM Cloud Technical challenge (2/2). # Compute Instance launcher script. # thanks to this StackOverflow post How to automate download and installation of Java JDK on Linux?. sudo gsutil cp gs://gbsc-gcp-project-cba-public/Challenge/noBarcode.bai . sudo gsutil cp gs://gbsc-gcp-project-cba-public/Challenge/noBarcode.bam . ## Run picard-tools BamIndexStats and write results to "bamIndexStats.txt"
## Append memory info for current instance to "instance_info.txt"
## Append filesystem info for current instance to "instance_info.txt"
## Shutdown instance. Note: this just shuts down the instance-not delete it. 3 . Its important to realize that the user_script runs on the instance as “root”- You can see this by getting the output of whoami. However, when you log into your instance, you log in as a user (with your username). Hence you will not see the files that your script may have downloaded- but if you change to superuser status, you can see the files that have been downloaded. Note- this only shuts down the instance , it does not delete it. So you could restart it and you will find all your files still there. 5. user_script is a great way for you to remotely, launch an instance, configure it, run jobs and shut it down so you don’t waste money keeping an instance running. If you have very complex environments that take a while to configure, you could create an instance with the configuration you like and save it as an image, give it a name and then launch that image as you need, saving you trouble of having to configure it every time! First create a dictionary of possible words from a corpus containing all abstracts from pubmed articles from a couple of years (after removing the common english stopwords). Take the corpus of potential recent papers (that could be recommended) and vectorize it ( i.e. basically represent the collection of text documents as numerical feature vectors.) There are many ways of computing the term-weights or values of the vector for a document, and after experimenting with a few, we went with one of the most commonly used weighting schemes –tf-idf. We used python’s scikit-learn library. The actual word-similarity calculation often involved multiplication between matrices of the order of ~650000x 15000 and these reading these in and multiplying them can become both computationally very intensive and impossible to store in memory. Enter HDF5, sparse matrices and pickle to the rescue ! Hierarchical Data Format version 5, or “HDF5,” is a great mechanism for storing large quantities of numerical data which can be read in rapidly and allow for sub-setting and partial I/O of datasets. H5py package/PyTables is a Pythonic interface to the HDF5 binary data format which allows you to easily manipulate that data from NumPy. Thousands of datasets can be stored in a single file, and you can interact with them in a very pythonic way: e.g you can iterate over datasets in a file, or check out the .shape or .dtype attributes of datasets. We chose to store our tf-idf matrices in the hdf5 format. Given that we were creating our “vectors” for each paper abstract using all the words in the dictionary; it was very likely that the matrix was very sparse and contained a lot of 0’s. Scipy’s sparse matrices are regular matrices that only store non-zero elements, thus greatly reducing the memory requirements. We stored our sparse tf-idf matrices in using scipy’s sparse matrices in HDF5 format. Further more, Scipy’s sparse calculations are coded in C/C++ thus significantly speeding performance. pickle and cpickle (written in C and about ~1000 times faster) is a python module that implements a fundamental, but powerful algorithm for serializing and de-serializing a Python object structure i.e it is the process of converting a python object into a byte stream in order to store it in a file/database, maintain program state across sessions, or to transport data over the network. Pickle uses a simple stack-based virtual machine that records the instructions used to reconstruct the object. It is incredibly useful to store python objects and we used it to store the Word dictionary, and easily recreate it everytime we had new papers we needed to convert to word vectors. 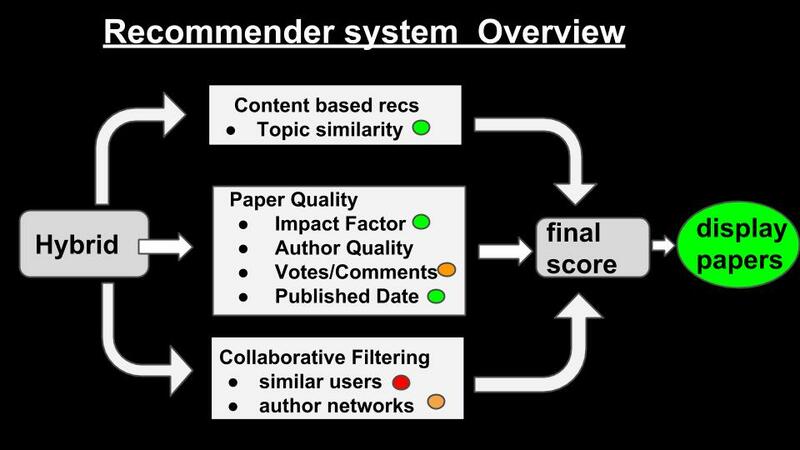 Here is an overview of the features we wanted to use to determine the “score” of a paper that we would then rank and output to the user as recommendations. We also decided that since we had created these “topics”, and were running the LDA inferencer on all the new papers everyday classifying them into topics, we would provide topic based recommendations as well- so if a new user came in, and was browsing the topics- they could see the top papers in that topic. Ofcourse, in addition to having high topic probability, these papers were ranked by recency of publication, impact factor of their host journal and tweet counts (if any)! For personalized recommendations, we decided we would first use topic similarity between the users papers (or library) and the corpus of all recent papers to filter or shortlist possible candidate papers to recommend, and then use word similarity to further refine the selection. The final ranking would use our special ‘sauce’ based on tweet counts, date of publication, author quality etc to order these papers and present to the user! This involved connecting various pieces of the pipeline and by September 2014, we had a working pipeline that generated and displayed topic recommendations and library recommendations (if a user had uploaded a personal library) on the website! !